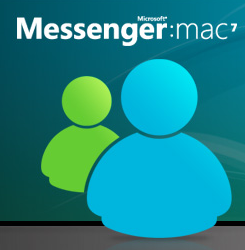 Hot on the heels of Windows XP SP3, Microsoft released an additional treat today, for Mac owners only, as the latest release of Microsoft Messenger for Mac (version 7) escaped into the wild. Version 6 brought the Aqua look and feel to Microsoft’s client amongst other features, so what’s new in 7? A redesigned buddy list with a search-as-you-type box for locating contacts in large buddy lists. Aping iChat with integration of Bonjour contacts drawn from the user’s local network. Users can apply nicknames to their buddies, particularly useful for contacts who frequently (and irritatingly) change their screennames! Notably for users connecting via a corporate Office Communication Server, Bonjour and searchable buddy-lists also extend to enterprise IM networks. Strangely, Messenger for Mac 7 promises audio and video chat support, but only to corporate users – essentially those running Microsoft’s Office Communication Server, though the company has indicated it plans to extend this to all users in time. Providing enterprise support before consumer seems an odd choice, given that the bulk of usage will be with consumers. As well as the new features, there are a number of minor aesthetic improvements, from more spacious chat windows, to cleaner notification windows and (ahem) a white outline around the application icon! Sadly, file transfer is as slow as ever (a 67k PDF took a minute!) though conversations with Y! Messenger users seem to be much more stable and less error-prone than before. So Steve Ballmer will be able to talk to Jerry Yang, but they better hope any contracts are teeny-tiny text files or better still emoticons! Each release of MSN Messenger (and indeed other official clients) on either Windows or OSX seems like a missed opportunity. I don’t think we’ve seen any real innovation for close to a decade in IM clients. more sophisticated presence management – for example, taggable buddies rather than fixed categories so I can make myself invisible to colleagues and friends but remain available to family. a plug-in architecture enabling Microsoft to quickly add support for emerging messaging services such as GTalk, Twitter and Facebook. an extendable mail architecture – maybe I’d like the new mail indicator to show my Gmail inbox, not Hotmail. Messenger for Mac 7 is an improvement, it works and it’s pretty, but the largest software company in the world can be bolder and can certainly do better. Thanks for the writeup. I’ve found MSN on Mac to be little more than an ongoing insult from MS, a subtle, multi-year act of punishment for daring to not use Windows. The client seems chronically under-powered and years behind in features (AV for corporate? Really? Come on). I’ve been using amsn and more recently adium for people I know on MSN, but most of those people have moved to Mac anyway and are now on ichat. I would have loved to get the same msn experience, or at least something comparable on my mac, but MS’s bitterness has driven me away.